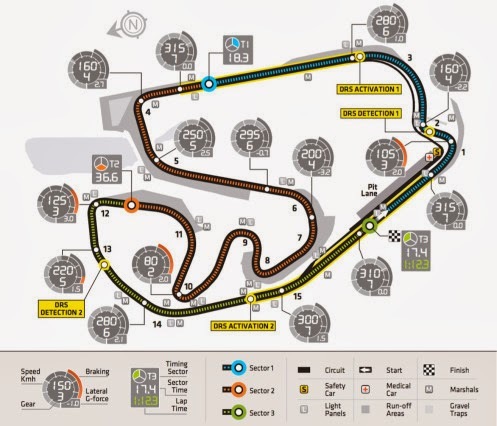 So it is Brazil for the final race of the year, to be held at the famous Interlagos circuit in Sao Paulo. This anti-clockwise race track has seen numerous world championship battles culminating on the starting grid, amidst hugely passionate and enthusiastic fans - All this in front of an amphitheatre style grandstand. Last year saw Sebastian Vettel fight an epic battle to win his third consecutive world championship. This year, even though the world championship has already been decided, we expect Interlagos to provide us with a race unlike the last eight, where Sebastian Vettel has won unchallenged. The design of the circuit and the forecast for heavy rains promise to end the season on a high and with some quality racing, minus the predictability. Pirelli have again brought the hard and medium compounds for this race as well, but we hope that the rains gods bless us enough to see the inters and wets in action come raceday. The bumpy nature of this track again puts a huge importance on traction, which straight away puts Vettel and Red Bull in the forefront, unless of course one of them drop the ball. Traction is also very important when you have a damp track, but the strategy that comes into play will give the others a chance to get one over the four time world champions. The fast sweeping nature of the track with a tight infield section allows for a difficult challenge for the engineers who have to compromise their setup for the long uphill start finish straight. Sao Paulo is not located at sea level and is about 2600 feet above. This means 7% lesser power from the engines and lesser aero grip due to the thinner air. Grosjean is looking ominous and ready to take his first win. His final test for this year will be how strongly he can bring the car home in changeable conditions. The Frenchman has come a long way from being banned from competing in the Italian Grand Prix of 2012 after the huge crash at Spa. Massa has always been strong in front of his home crowd, and it being his last race in scarlet red overalls, we should see some fireworks. Hopefully we can catch a glimpse of the 2008 Felipe Massa.